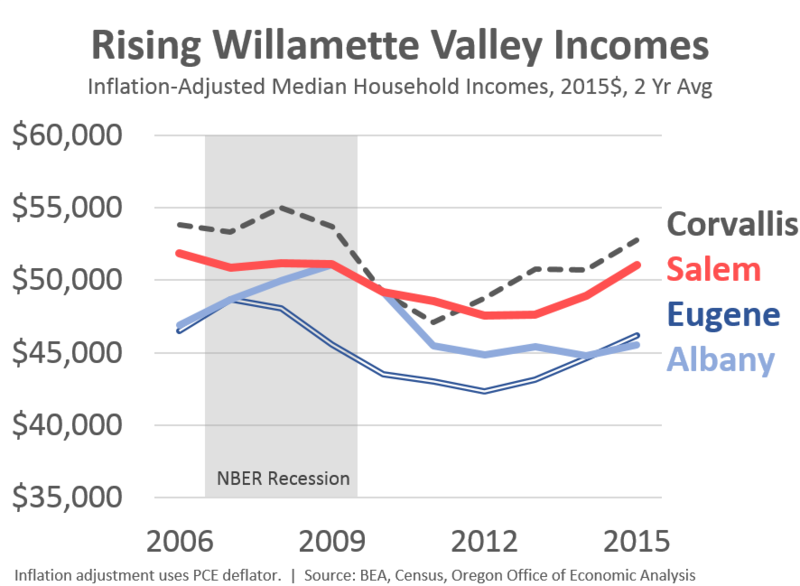 This edition of the Graph of the Week highlights improving household incomes here in the Willamette Valley. While it was included in the Salem outlook slide deck posted the other day, it deserves to be pulled out. As we have discussed numerous times lately, the tight labor market has begun driving many positive economic trends. The share of the working-age population with a job today is back to where it was last decade. Wages are rising across all industries and across all regions of the state. This combination — more people with jobs, and wage gains — is driving household income gains for those in the middle and bottom part of the income distribution. These households only have wages and the safety net in terms of income and purchasing power. They are fully reliant upon a strong economy to generate any sort of gains. The economy is now fully into this phase of the business cycle where such gains are finally being realized. Furthermore, income growth is and will help with housing affordability too. Note: the reason I am using 2 year moving averages here is due to the noise or volatility in some of this data, as reported by the Census. This is particularly the case for Corvallis, and a little bit with Salem. Mathematically it works out, of course. However, in terms of the eyeball test, the average looks to undersell the improvements in the Albany MSA (Linn County). Albany has seen growth in its median household income from the worst of the recession.